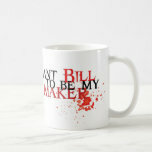 After gifts for fans of Vampire Bill? Or maybe it's you who deserves a little Bill Compton loveliness in your life? Check out what's on offer! He's the most charming Southern gentleman since Rhett Butler. And frankly, my dears, we ALL give a damn! 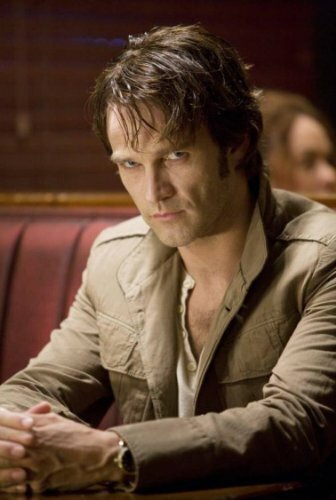 Ever since Bill Compton first smiled at Sookie, fans have flocked to his corner. 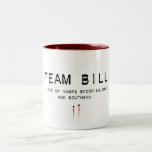 Team Bill is arguably the largest of the True Blood cohorts. Only Team Eric comes anywhere close. 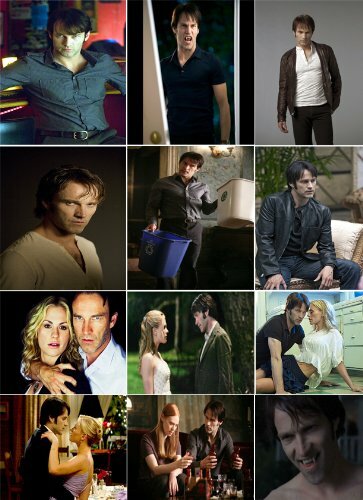 Now I've collected together a feast of Team Bill gifts for fans of Bill Compton. 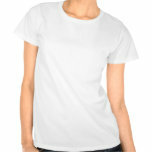 Whether buying for yourself or a Team Bill cheerleader, have a look at this. 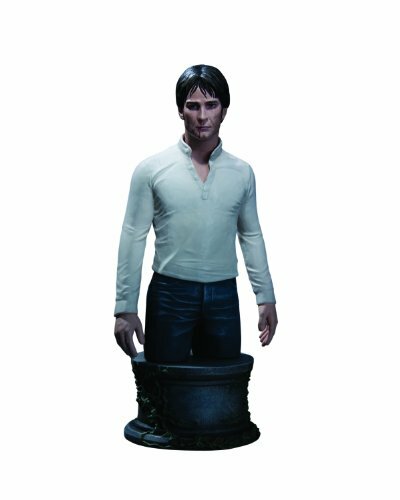 Wearing a classic Vampire Bill outfit, this figurine is part of a limited edition set. When they've gone, they've gone. This makes it a collector's item, rather than something mass produced to fling at fans. Standing 6.75" high, the Vampire Bill bust is cold-cast in porcelain. The other two pieces in the set are Sookie Stackhouse and Eric Northman. Bill: "May I Call Upon You Sometime?" William Compton was born in Bon Temps, Louisiana, on April 9, 1835. He was raised on his parents' small farm, and helped build the Compton House. Bill married Caroline Halliday during the 1850s. They had two children - Thomas, who died of pox in 1868, and Sarah, who survived into old age. In 1862, Bill became a First Lieutenant in the 28th Louisiana Infantry. He fought for the Confederacy during the American Civil War. Three years later, the surrender of the South caused Bill's unit to scatter. He found himself starving and exhausted at the remote cabin of Lorena Krasiki. After refusing her sexual overtures, she revealed that she was a vampire and turned him into one too. Unable to endanger his family by returning home, Bill traveled around the USA with Lorena. By 1935, Bill threatened suicide if Lorena didn't release him from her maker's bond. He struck out alone. 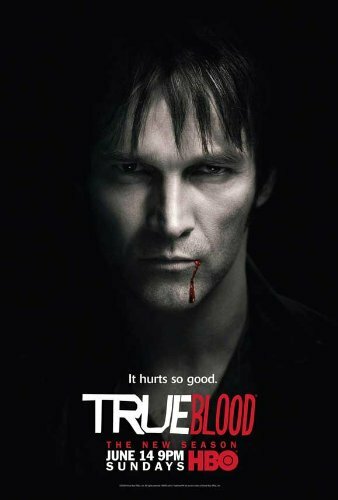 Two factors allowed Bill Compton to finally return to Bon Temps. The first was the Great Revelation, which let the world know that vampires were amongst them. The second was the death of the last Compton. Bill took advantage of brand new legislation to reclaim the rights to his childhood home. He visited Merlotte's as a way to integrate himself back into the community. Those around him were the great-great grandchildren of people he'd once known. Amongst them was Merlotte's waitress Sookie Stackhouse. It was practically love at first sight for them (both on screen and off). Sookie helpfully arranged for service workers to repair his home during daylight hours, while at night the couple grew ever closer. But the course of true love has never run smoothly, particularly when a cross-species relationship is involved. Everyone from Sookie's human friends and family, through to vampire officials (we're looking at you, Eric), and even deities like Lilith seem intent upon destroying this little romance. Desperately starving, Bill Compton enters the home of a lonely old woman. Olivia lives in hope that her son Stanley will visit, but he never does. Team Bill or Team Eric? I guess that, if you're perusing this page, you've already made up your mind on that issue! It's Team Bill all the way. Sookie Stackhouse might not have had much joy with human dates (being able to read their minds and all is a little off-putting), but she's never wanted for supernatural attention. Everyone from fairies to werewolves wants a smooch with her. But Bill Compton was there first. Oh yes! 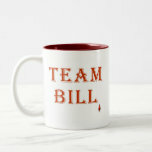 Team Bill involves supporting Bill Compton. Look at him! How can you not? He went mainstream as soon as it was possible to do so. Despite Lorena's repeated attempts, he is not at home with his vampiric instinct to kill. Bill betrayed his queen in order to keep Sookie out of her clutches. He's never backed down from saving her from some truly terrifying entities either. Bill rose from his grave during daylight, severely endangering himself, when he sensed that Sookie was in mortal danger. You don't see Eric doing stuff like that. Sookie's grandmother approved of him. I don't know about you, but I trust Adele's judgement on these things. While others have friends in high places, Bill IS the dude in the high place. Whether crowned as King of Louisiana, sitting on the board of the Authority or becoming a God, he certainly positions himself where he can best protect those he loves. He has a caring and compassionate side, always striving to keep in touch with his humanity. Just scroll up and watch that glamor scene with Olivia again. The chemistry between Bill and Sookie is so genuine, that they married in real life too! Bill: "I Can Smell the Sunlight on your Skin." That last one would be perfect for someone who looks like Jessica Hamby. Then again, if they did, they wouldn't need a mug for perfection! ... or, at least, the actors who play them. I know that my jaw gaped, when I learned a few of these. Not to mention a certain amount of delighted cheering. 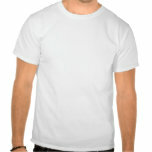 Looking for gifts for fans of Eric Northman? Or perhaps you want to treat yourself to a juicy bit of Team Eric merchandise? Come on in! 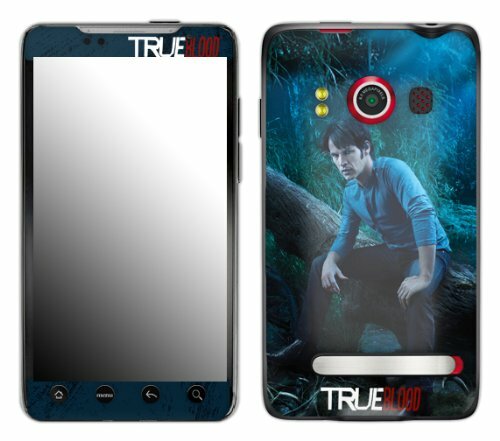 On the hunt for gifts for fans of True Blood's Alcide? Come see what treats we have in store for you! He has old-fashioned manners, but that's about it. I can't say that 'strait-laced' is the first adjective which comes to my mind about Bill Compton! Bill's a bit straight-laced really, isn't he? 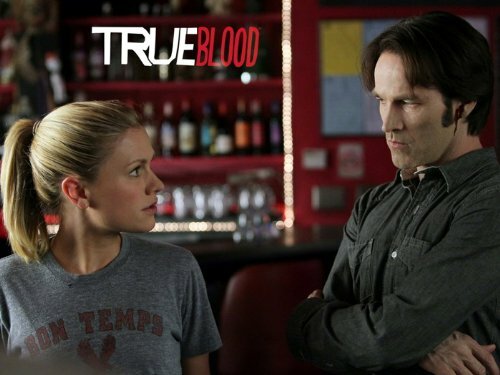 Is that no more True Blood articles please? Or desperately fanning yourself, because it's become rather hot in there at the sight of Mr Compton?